There is nothing as sweet as a child who asks questions about the world around him or her. “Why is the sky blue?” “Where do babies come from?” are the two that immediately come to mind. In this case, Little Bear wants his mother to tell him where the stars come from. It gives her a chance to tell him a Native American folktale that will entertain him as well as relate a fascinating story..
With beautiful l illustrations done in Native American colors, Mrs. Nielson illustrates the story, as it unfolds through the word of Mother Bear and the imagination of Little Bear. 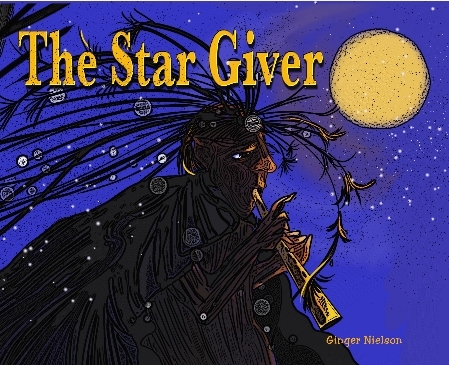 The Star Giver holds the stars close until night, when it is time to release them, then waits until morning to finish his task. You will love sharing this story with your children at bedtime, as well as any other time of the day. And she tells you to look for the “secret on the last page of this book”. What is it? You need to get the book to find out. From her website: “Ginger Nielson lives at the top of a hill, near the edge of a forest in semi-rural New Hampshire, USA. There is a magic wand on her desk, a dragon in her basement, and a tiny elephant in her studio. Everything else is nearly normal.” Sounds like a great place for her imagination to run rampant through the wonderful, imaginative stories that she illustrates, whether that of her own or another writer. Ginger Neilson has written and illustrated an adorable book about Gunther, the Underwater Elephant. The story is different from the normal children’s books in that Gunther does not get into terrible trouble that he cannot get out of himself, but he does show his courage and intelligence when a tragedy occurs. Gunther, the little elephant, is accidently separated from his family and ends up floating out to sea where he learns how to use his trunk as a snorkel and meets a creature who helps him return home. “When the bright morning sun woke Gunther, he found himself in the middle of a swirling sea. When he gets close to home, he is met by a tropical bird who tells him of a tragedy involving his mother. Follow Gunther as he figures out how to save the day with some of the things he found on his underwater trip. Children will love this story and stare in wonder at the lovely illustrations that are important in telling his story. This is a wonderful book to read to your children as a bedtime story and will also be great for any time reading. Ginger Neilson is a full time children's book illustrator and author. Her home and studio sit at the top of a hill, near the edge of a forest in semi rural New Hampshire. There is a magic wand on her desk and a dragon in her basement. Everything else is nearly normal. She has illustrated over 25 children’s books. This is the first one she has written as well as illustrated.